Stumps/residual limbs/whatever else you want to call them change in volume throughout the day as a result of activity levels, air pressure, temperature etc. Over time, a stump will reduce in size and will eventually need a new socket. With a 'fresh' amputee, they will require more sockets initially, as the swelling reduces from the original surgery. For example, since my most recent surgery, my socket has lasted me about 2 months whereas a friend of mine who has been an amputee for 30 years last had a socket 7 years ago. Effectively, this suspension system is exactly what it says on the tin - suspended by a sleeve. This system can be quite good as it allows a lot of padding for the stump but it can also be very bulky and restrictive to knee movement. Generally, an amputee will wear a liner, which will normally be silicone. More active patients will normally wear a harder silicone, while less-active amputees will have a nice soft silicone, which is comfortable for the stump. With a hard socket (outer shell) and a squishy, shape-changing stump, there has to be a method to always make sure your leg stays on - the art of stump socks. Effectively, they fill in the gap between your socket and the size of your stump is managed daily by the application of thin and thick socks. It's a bit of an art and as an amputee, you learn to adapt and learn what your stump needs. It's a big faff but my leg tends to stay attached so I shouldn't complain! A very common system used by all a range of abilities. A padded liner with a pin at the end, which then slots into the pole component of the leg. Changes in stump volume are dealt with socks, similarly to the sleeve suspension system however the walking pattern and weight distribution is slightly different. When your leg is lifted, the prosthetic pulls off from the bottom of your stump, instead of the thigh, so it's not a suitable system for everyone. Here I am trying my check socket - a clear socket which allows your prosthetist to check the areas of pressure before making a full socket. With no sleeve, there's more knee movement and it's not quite as warm as a sleeve system (because there are less layers). From an aesthetic standpoint, there's no sleeve blocking the prosthetic so you can have a design on your socket that can be seen by others. 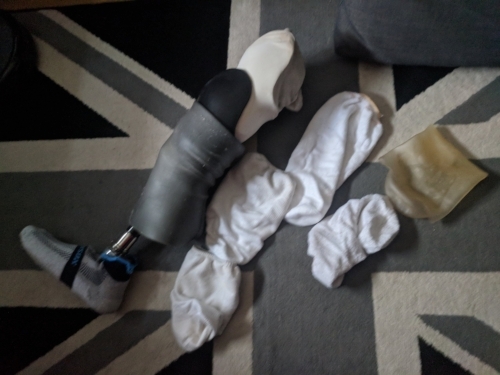 Prosthetic centres generally like you to be a year post amputation as the liners can be quite expensive and depending on your centre, you may need to apply for funding. I'll be getting my pin socket next week so let's see what it's like to use long-term. A liner, with a sleeve which creates a seal around the top of the socket. A pump and exhaust valve then removes the air between the socket and liner to ensure a snug fit. Studies show that this system regulates volume changes and reduces the friction on your stump. Having said that, it is essential for a snug fit and a working valve, or your leg will easily fall off. With a suction system, air is expelled through the valve and your leg can frequently hiss, as the air escapes. I have no personal experience of walking/running with a vacuum/suction system however I am sure it will be a system that I will try in the future. Sockets are a very personal thing and everyone has their own likes/dislikes with regards to a suspension system. I suppose as long as your leg doesn't fall off and you can move around, it doesn't matter too much. Your prosthetist will have the best idea of what is best for you - have a chat with them.